Formerly in the Collection of National Geographic; to a Private American Collector. Margaret Bourke-White began her career, in Cleveland, with a soft-focus Pictorialist approach that gradually transformed into her signature, crisp modernist style. Drawn to skyscrapers, she made her first photograph of the Terminal Tower in 1927. By the end of the year, she was designated official photographer for Daniel Burnham's City Beautiful project, chronicling Cleveland's architectural icon from different vantage points. 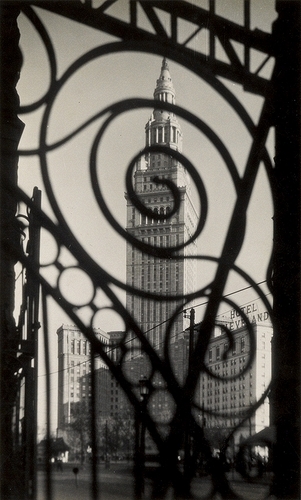 This photograph, which is featured in Margaret Bourke-White, Photographer of Design 1927-1936, depicts the soaring structure with a unique overlaid iron design element that alludes to the city's industrial heritage. Signage advertising the Hotel Cleveland appears in the background, behind the tower's solid rectilinear forms. With this photograph, Bourke-White's oeuvre assumes a new level of sophistication that underscored her reputation as the photographer of the Machine Age. Subsequently, her work was featured in the inaugural issue of LIFE magazine, as well as FORTUNE, and NATIONAL GEOGRAPHIC. This image appears on the front cover of Margaret Bourke-White: The Photography of Design, 1927-1936 and on page 26.